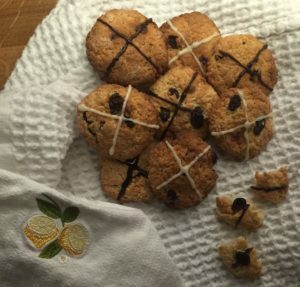 If you are in need of some Easter baking inspiration, why not try these super simple Hot Cross Cookies? Perfect to bake with little ones! Now all the ingredients are set out, prepare to get baking! Pre-heat the oven to 180C/ 356F/ Gas Mark 4 and line the baking trays with some lightly greased baking sheets. 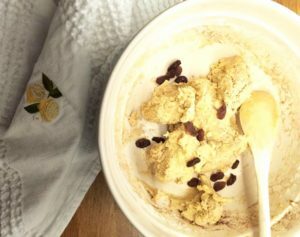 In a large mixing bowlbeat together the butter, sugar and milk or buttermilk until pale and creamy in texture. Sift in the Mortons flour, cinnamon and baking powder, then combine to make a dough. Add in a little extra milk or buttermilk if there are still some dry ingredients left in the bowl but careful not to add too much. Add the raisins and the dark chocolate and mix to combine together. Break the dough into small pieces and roll these into balls, roughly the size of an egg in your hands. Whilst still in your hands, press these gently to flatten so they are roughly 1 cm thick, and place onto the baking trays leaving enough space for them to expand (2-3cm apart). Bake for 10 mins until golden brown and carefully remove from the trays onto the wire racks to cool. Melt the white chocolate on a low heat and carefully drizzle a cross along the top of each cookie once they have cooled. Leave aside until the white chocolate has set and then be sure to enjoy them!